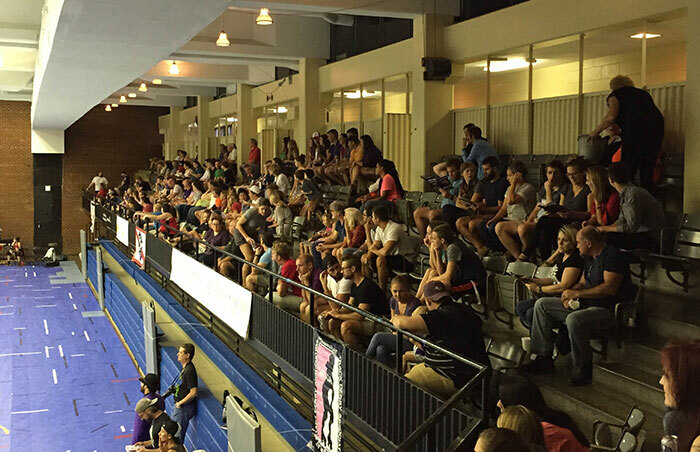 I attended the Charlotte Roller Girls bout against the Columbia QuadSquad on September 12, their penultimate bout of the 2015 season. 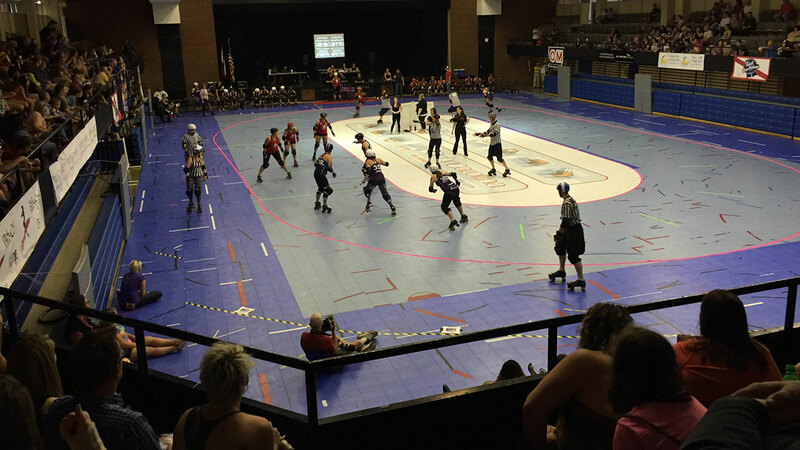 I didn’t know much about roller derby when I got to the Grady Cole Center in Elizabeth (next to Memorial Stadium) but I learned as the bout went along and wound up having a great time. 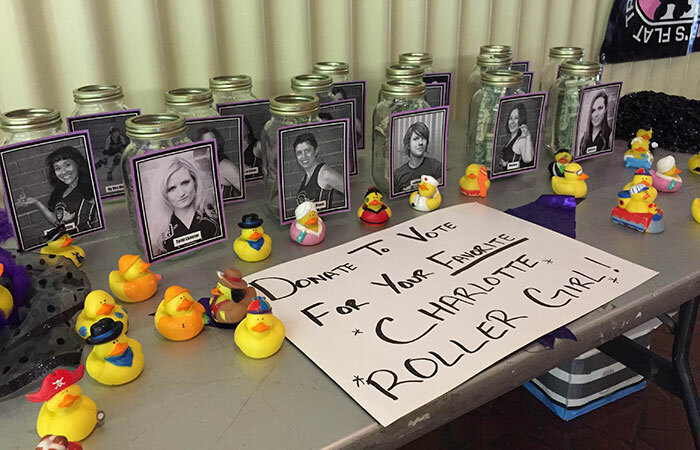 The Charlotte Roller Girls host their season finale October 10. They’re also hosting a blood drive if you want to donate before the bout. Advance tickets are $12 (kids are $7 but 5 and under are free) online or at Common Market or Sleepy Poet antique mall. Walk up tickets are $16. Parking is $5 cash in the lot next to Memorial. You can tailgate there but you can’t grill. Bout: A bout consists of two 30 minute periods. There are seven (yes, seven) refs on the track at the same time. Jam: A jam is one cycle of play. The referee signals the beginning of the jam and, once it begins, both teams try to block the other team’s jammer from scoring points. A jam ends when a jammer who scores waves off the jam or after two minutes, whichever comes first. New players from both teams take the track after each new jam. Jammer: Each team has one jammer in the bout at all times. The jammer is the only skater who can score points. They score by passing opposing skaters after skating through the pack once. Don’t know who the jammer is? Just look for the star on their helmet. Pack: Eight skaters from each team form the pack during each jam. 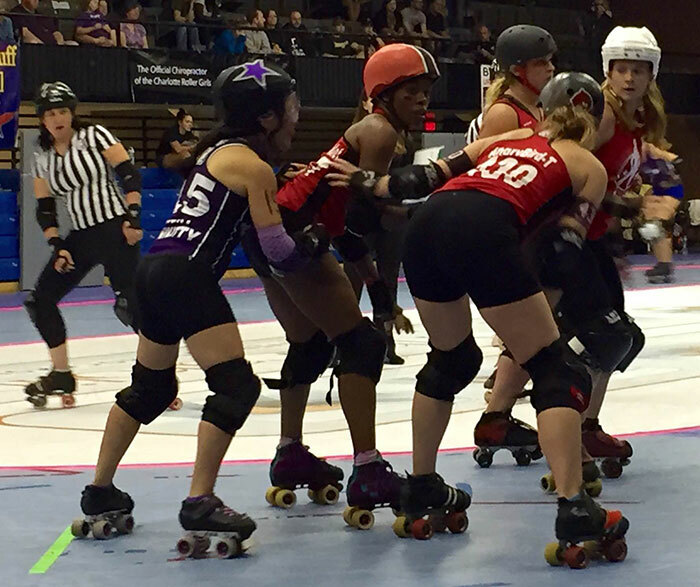 The pack’s job is to prevent the other team’s jammer from scoring. Once the jammer has skated though the pack once they can begin scoring points. 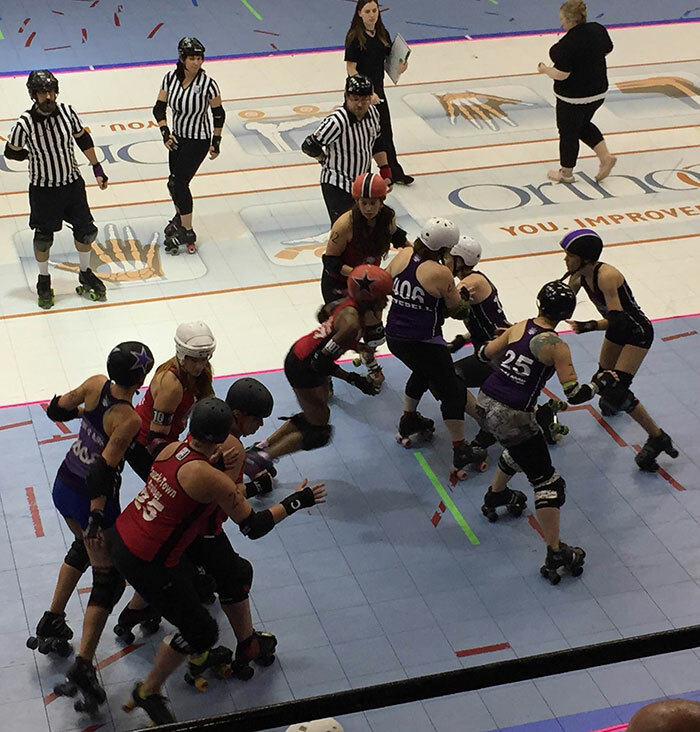 Power Jam: A power jam occurs when one team’s jammer is in the penalty box and the other jammer continues to try and score points around the track. 2) Don’t know what’s going on? Ask someone. If you’re new to roller derby you might feel overwhelmed at first. That’s OK. The Roller Girls have you covered. There are people literally holding “ask me” signs throughout Grady Cole. Ask them anything about roller derby. Go ahead, ask them. They’re happy to help. Scoring is fast and furious in roller derby. It’s normal to see teams with more than 100 points at halftime. I was shocked at how quickly both teams scored. The action was just that fast. When the bout ends, the after party begins. The Roller Girls, family, friends, and fans head out to a local watering hole and have a blast. The September bout after party was held at Midwood Country Club. The after party is always listed in the free game program. Thinking about trying roller derby? You’re in luck: The Roller Girls welcome new players. They hold meet and greets for new skaters throughout the year. The next meet and greets are September 29 and October 9. Learn more about the Roller Girls on their Facebook page.